Subtitle: boredom. The only good thing is that finishing my project, writing up the dissertation and doing the thesis “defence” (also known as a viva voce exam) are worth 50% of the final grade this year. The dissertation writing itself was actually enjoyable because it’s good to make sure you know what you did and what you didn’t achieve with the experiments. For instance, the in silico melanoma model I constructed from available experimental data could accurately predict that melanoma cells that had become resistant to the widely used drug, vemurafenib, would be more motile and possibly more invasive. However, the model wrongly predicted how (i.e. by which mechanism) the cells had become more motile. All in all not a bad outcome for a 16-week project, I think. During the writing process I regularly made use of notes I’d taken during a lecture on scientific writing. Among other things I had to remind myself a) which tenses to use for each section of the thesis (e.g. past tense to describe results and methods, present tense to describe data previously presented in the literature) and b) when to use “compare to” versus “compare with”: the former when comparing things that are different with respect to each other and the latter when comparing things that are similar. Also not to confuse “while” and “whereas”. Never to begin a sentence with a numeral. To use simple sentences, although that is sometimes quite hard when my mind becomes corrupted by German influences. Only five more days to go until freedom. 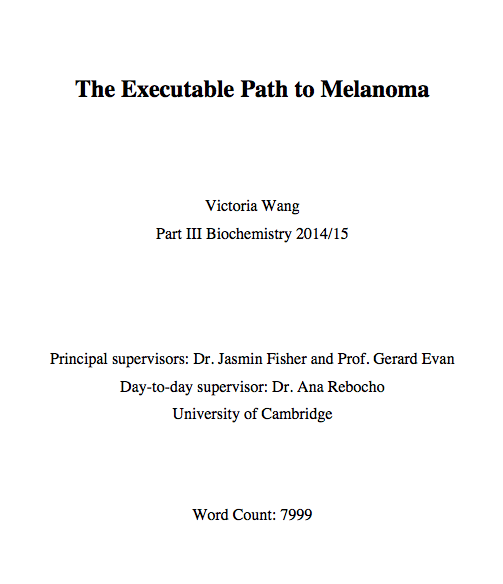 This entry was posted in Opinion, Research Project and tagged dissertation, melanoma, revision, thesis by Victoria Wang. Bookmark the permalink.